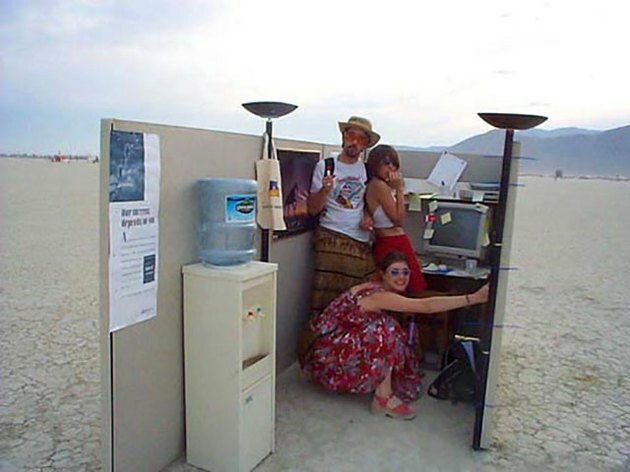 Nineteen years ago I went to the Burning Man festival in the Black Rock Desert of Nevada, 120 miles north of Reno, for my very first time for a week of camping, exploring art, music and culture to cover it for a (now defunct) website and TV show called Wild Wild Web. At Burning Man 1999 I interviewed the event's founder, Larry Harvey (who passed away at 70 earlier this year), exploring the interactive art and events, and I was so impressed by what I saw that I went back for five years in a row (1999-2003), and then ten more times in the past twelve years (2005, 2006, 2008, 2011-2017). 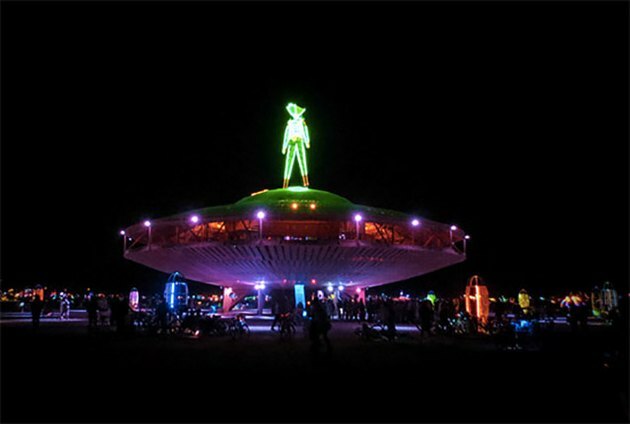 I’m aiming to get there this year as well to experience my sixteenth year out there in the desert under the stars. What compels me to spend 16 weeks of precious vacation time in the desert? 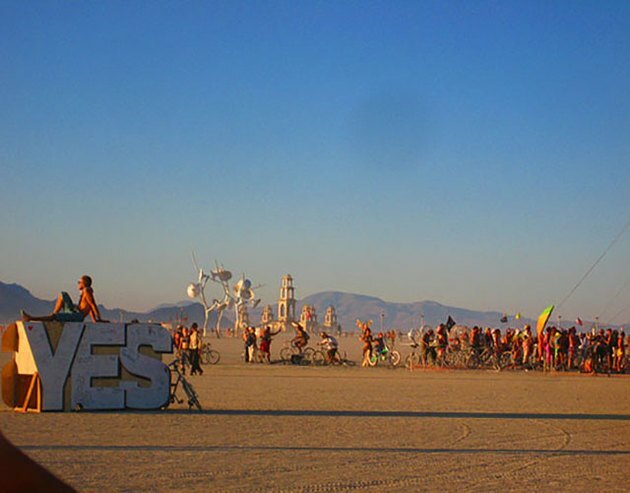 And why is Burning Man something that I think almost everyone should consider attending at least once? 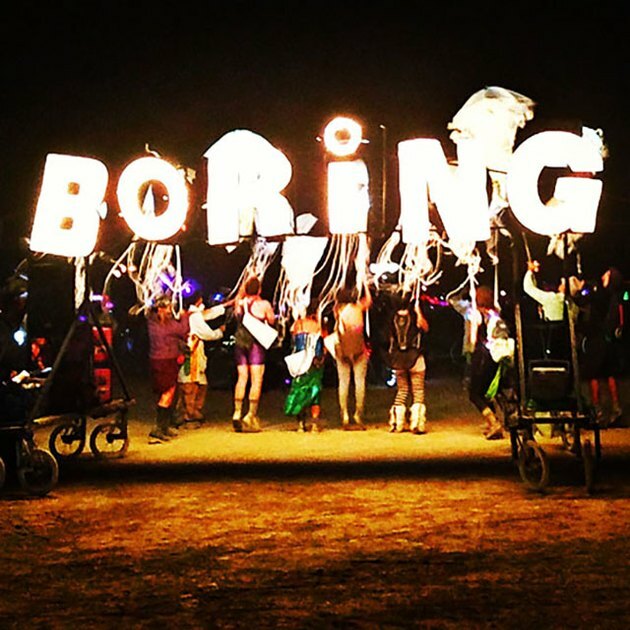 Aren't there other experiences in the world that surpass Burning Man? As a seasoned traveler who's been to festivals, events and galleries everywhere from Belgium, Croatia, Denmark, Estonia, Finland, Japan, the Netherlands, Russia, Spain, Sweden, Thailand, Turkey, the Maldives, Vietnam and many other places, there’s nothing that I've encountered anywhere in the world that comes close to rivaling the art, music, culture and overall experience of Burning Man. 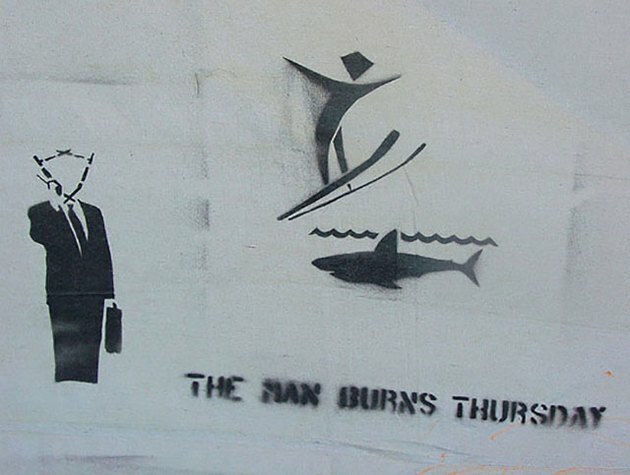 Didn’t Burning Man Jump The Shark or “Sell Out”? 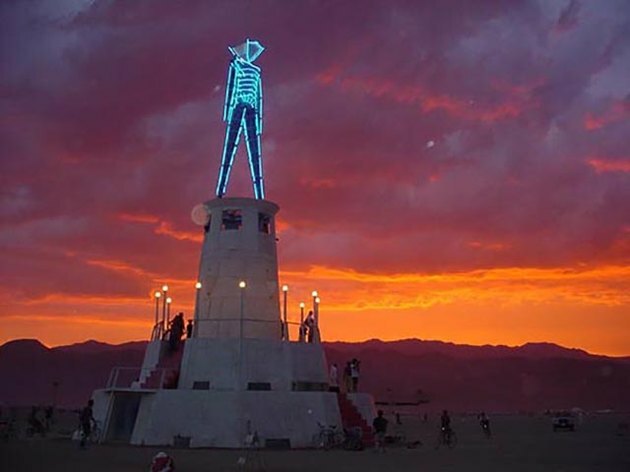 But you may be asking yourself, “Hasn't Burning Man jumped the shark?” Isn’t it filled with tech billionaires who are “ruining the event for everyone,” as proclaimed by Nick Bilton in The New York Times in 2014? 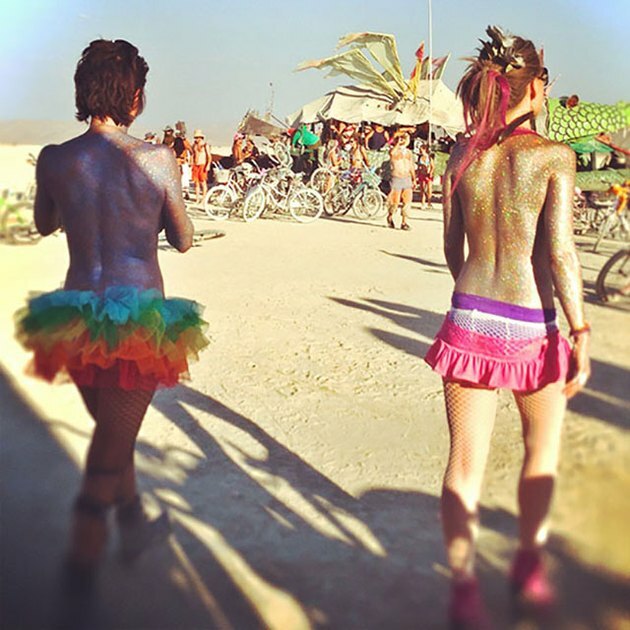 As a wise friend of mine said: “If you’re so concerned about how other people are experiencing Burning Man, then you’re definitely not doing Burning Man right,” meaning most people are out there doing their own things and seeing and participating in so many incredible experiences that they aren’t concerned with how anyone else is experiencing the event. 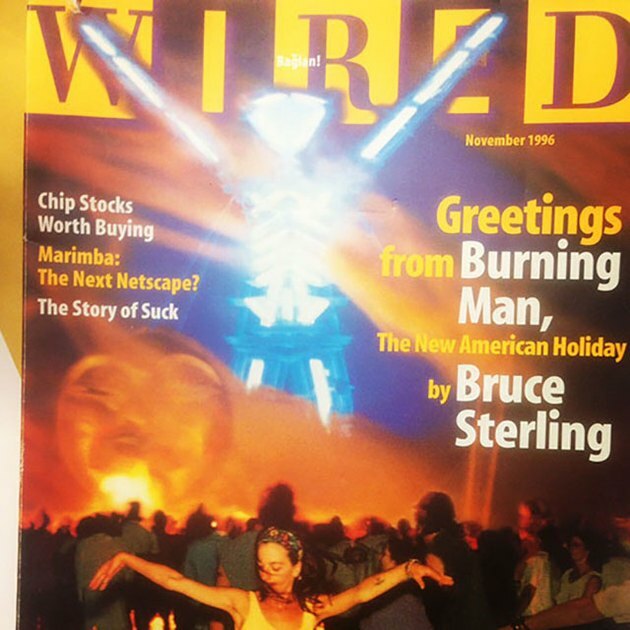 Tech people were reading and buying that magazine and no doubt — like me — also inspired to attend Burning Man way back then. 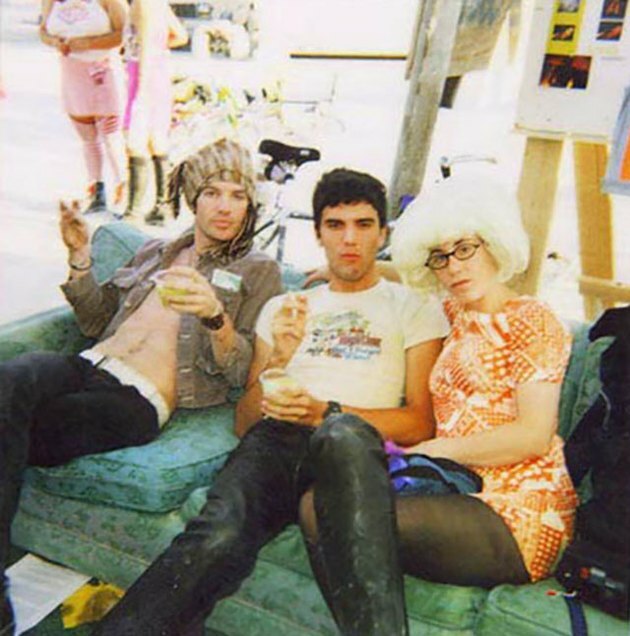 Google co-founders Larry Page and Sergey Brin went to Burning Man in 1998. They didn’t ruin the place, and it’s not being ruined by rich people now. 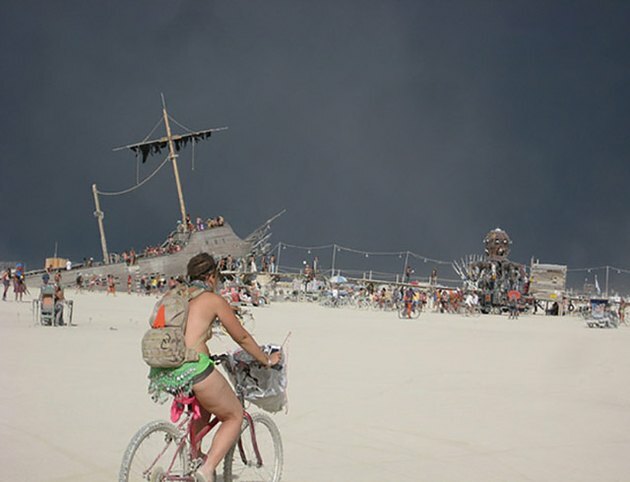 Burning Man takes place on a dry prehistoric lake bed in the middle of Nevada's Black Rock Desert. 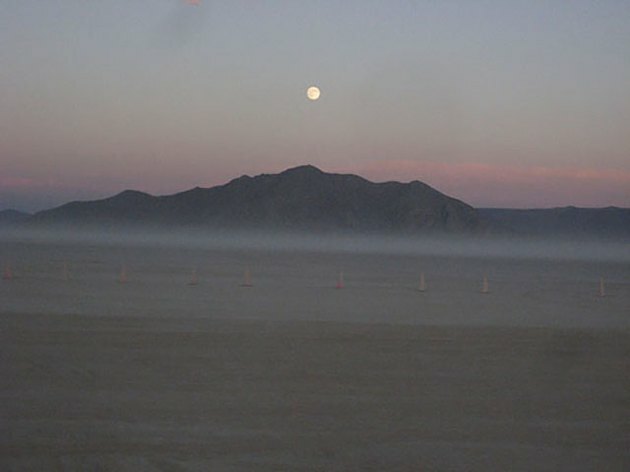 It's a remote, extreme location that becomes Nevada's third-largest urban area (after Las Vegas and Reno) of over 60,000 people within one week (complete with a café, post office, daily newspaper) and then vanishes afterward, completely dismantled in accordance with the event's "Leave No Trace" ethos. In America especially, we live in a world surrounded by consumerism and electronic communication, and these two things can lead to people's feelings of social isolation. 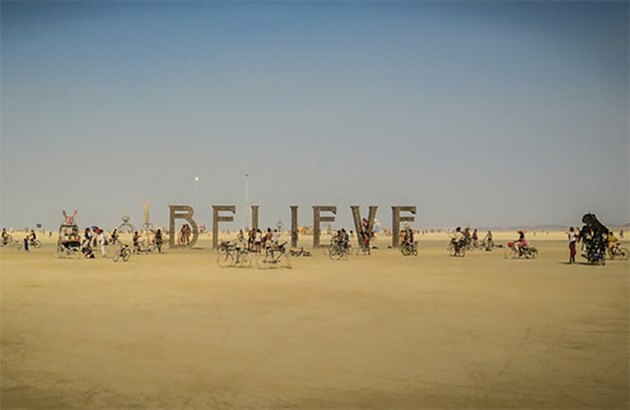 Burning Man is more than an event - it's an experiment in radical self-expression and community. 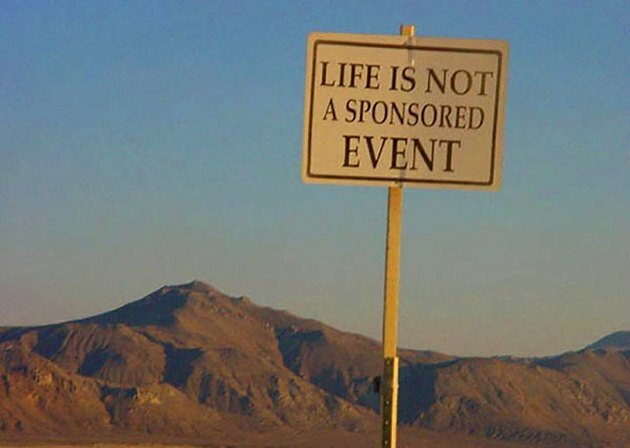 The Burning Man community forbids vending of any kind (including food and water), advertising and sponsorship. 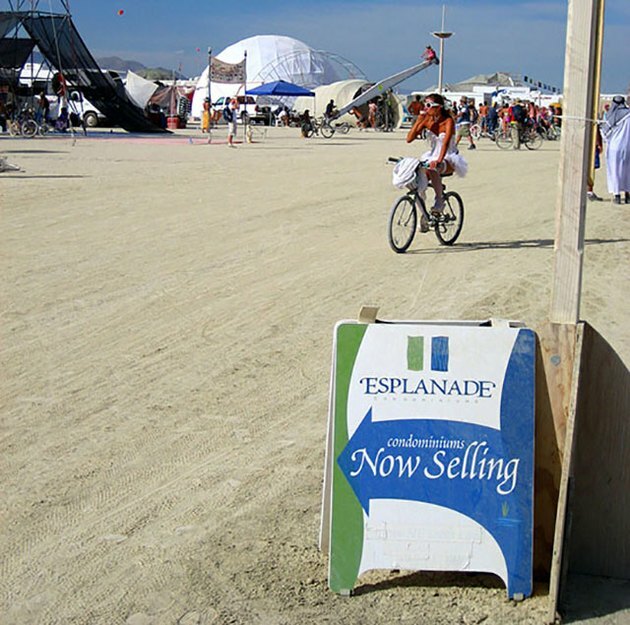 The only thing for sale at Burning Man is ice, which is sold to benefit local schools and charities. The organizers and community members advocate a gift economy in which people give and share food, resources and experiences with friends and strangers accepting nothing in return. 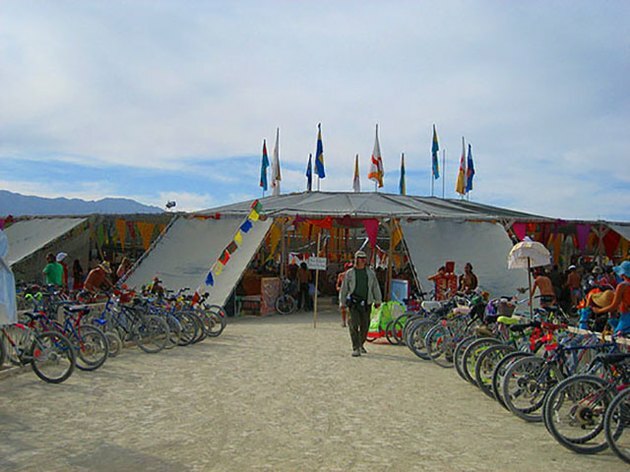 When I first attended Burning Man in 1999, I thought it was a "barter economy" and brought extra items to trade with other attendees. 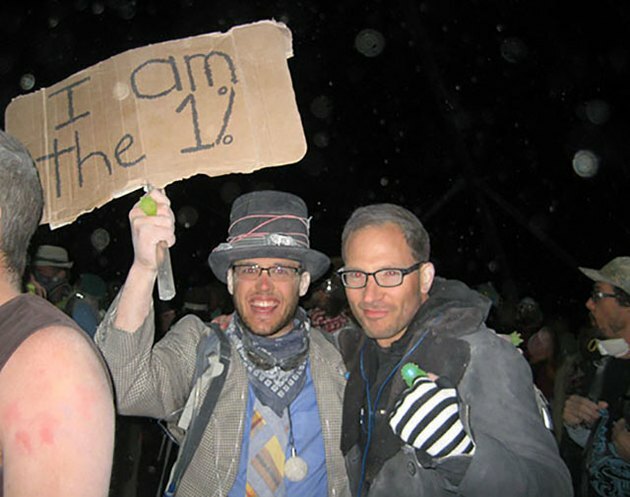 I quickly learned that people at the event will give you an ice cream cone, banana pancakes, library book, yoga class, shiatsu, massage, ride on a unicorn art car across the desert, live music performance, cocktail or beer without expecting anything in return, except perhaps an answer to a silly question, conversation or a song. Everything is a gift. 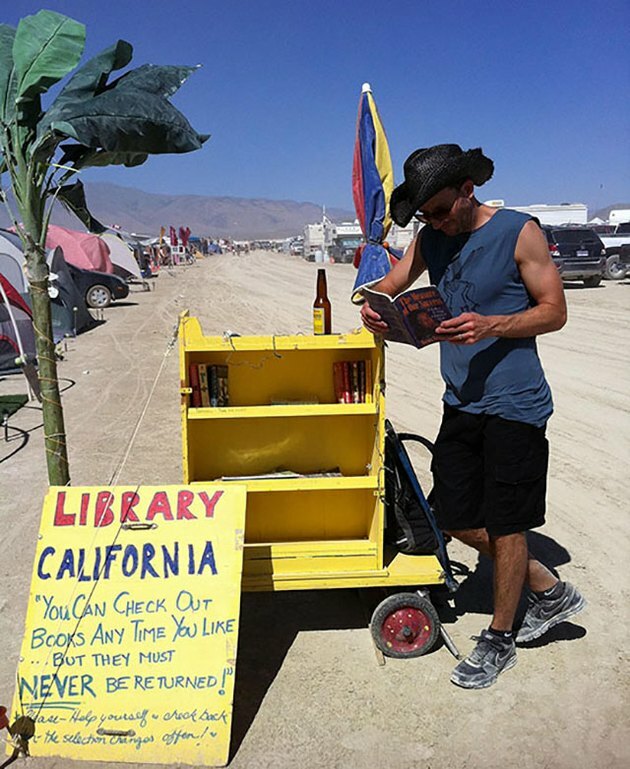 There’s even a Library California with the tagline “You can check out books any time you like, but they can NEVER be returned.” As one of the Burning Man volunteer coordinators wrote in a blog post: "The gift culture is most useful because it is a social lubricant - a legitimate way of reaching out to our fellow human beings that is non-exploitive and establishes a connection between people who have no other reason to talk to each other." 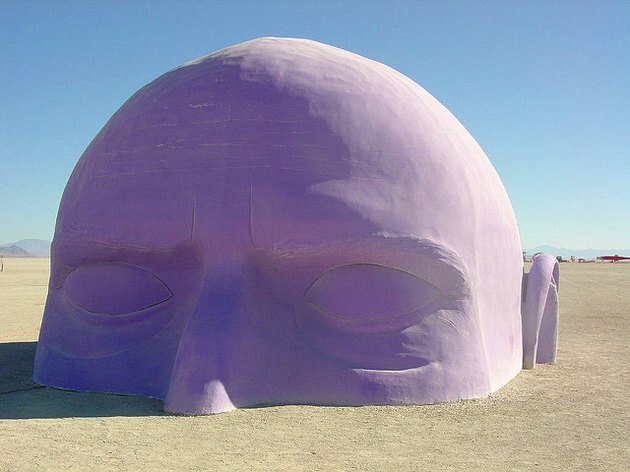 The art of Burning Man is a must-see. Photos, though often striking, don’t do it proper justice. From the Billion Jelly Bloom (50 or more glowing jellyfish undulate in a bloom throughout the desert) to Dance Dance Immolation (a desert adaptation of the arcade video game Dance Dance Revolution where players don a fireproof aluminized firefighter's proximity suit and if you dance well the computer shoots propane flames into the sky, but if you dance poorly, it shoots flamethrowers at your body! ), the interactive art delights people and it gets them interacting with each other in ways they may never have before. 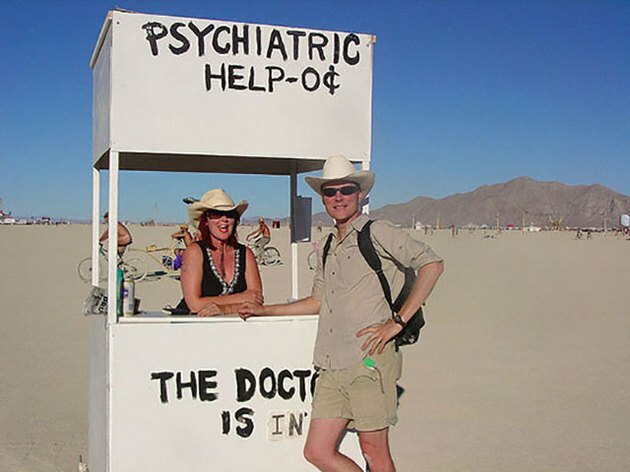 My art project at Burning Man 2005 was a Psychiatric Help booth (Photo below – in homage to Lucy’s booth from the Peanuts comic strips) out in the desert. 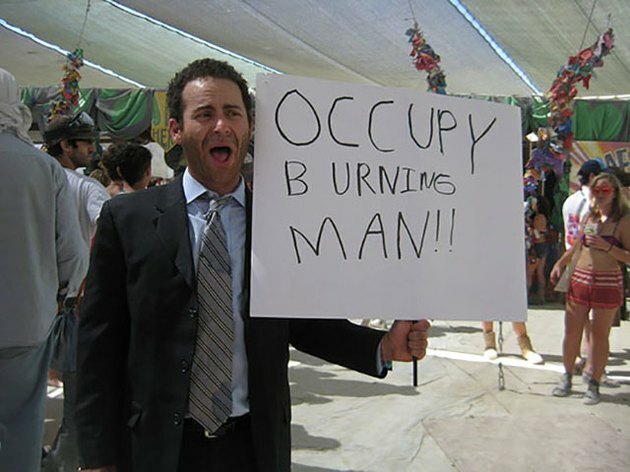 It was mentioned in the Economist magazine’s write up of Burning Man in September 2005. 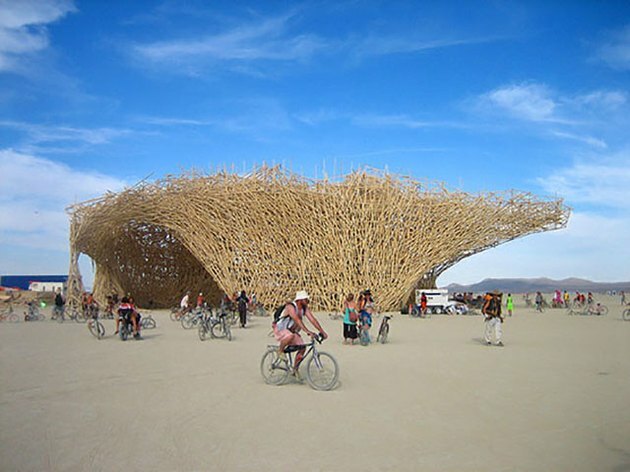 In addition to The Man (the 50-foot tall wooden man that stands on a thematically different base each year) every year at Burning Man there is a large uniquely-designed temple created by an artist. 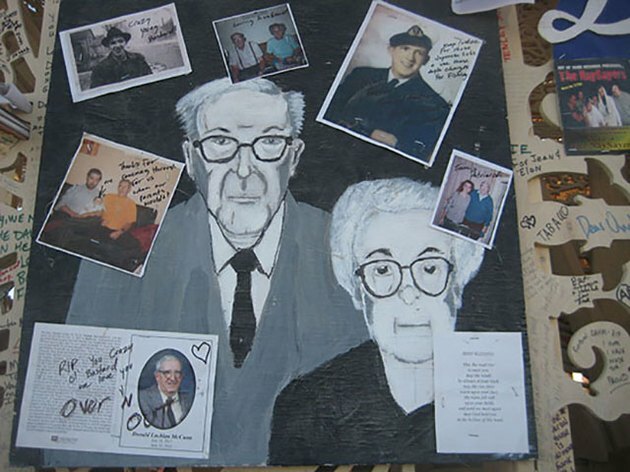 People bring photos, paintings and letters for their friends and loved ones who have died or of things that are troubling them, and post them throughout the temple. It becomes filled with offerings and intentions. 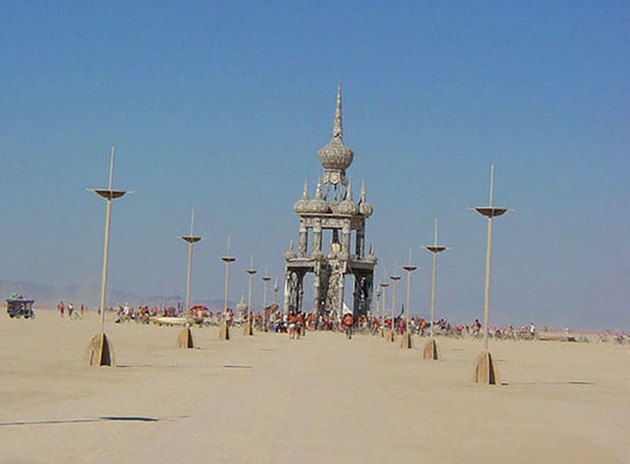 The temple is the most solemn and beautiful pace in all of Black Rock City. 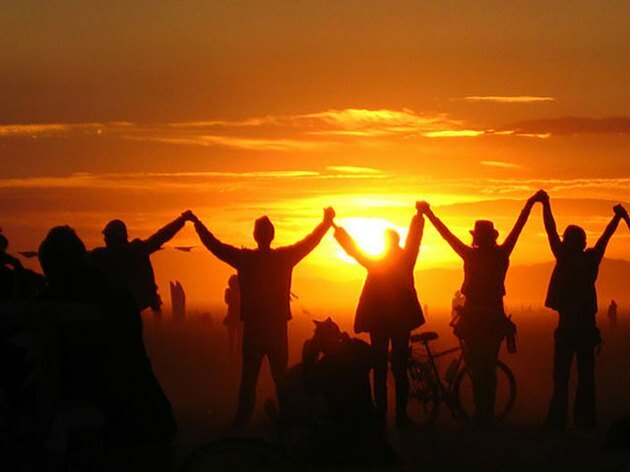 One of my all-time favorite Burning Man moments was a somber afternoon at sunset when at least 100 people were gathered on the floor in the center of the Temple of Transition at Burning Man 2011 and they started singing “Amazing Grace” together with the most beautiful voices I had ever heard. It definitely was a moment that made hundreds of people cry from the sheer beauty. The temple gets burned on the Sunday evening at the end of the event, the day after The Man burns. 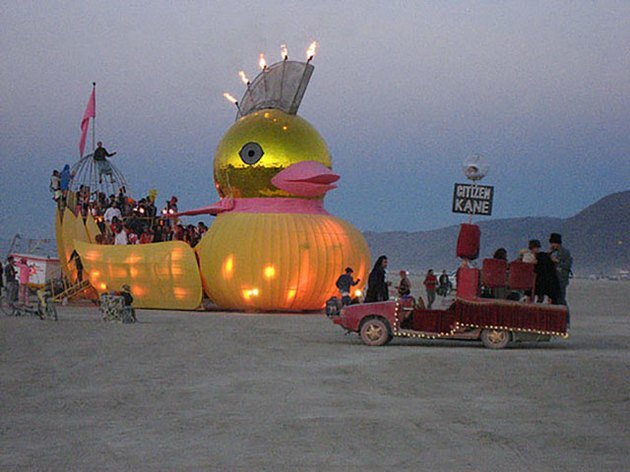 The only cars allowed to drive around Black Rock City during the event are registered art cars. 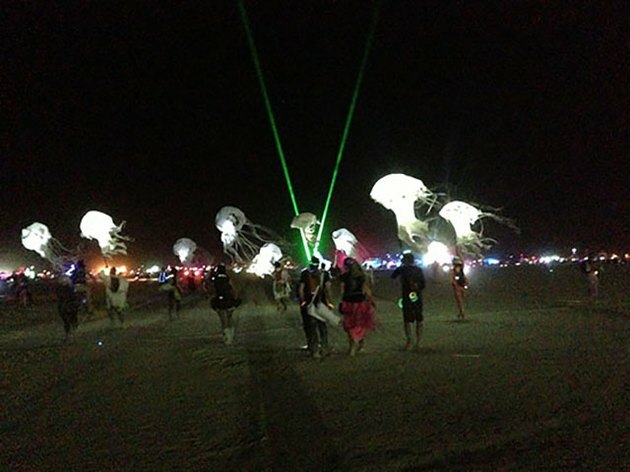 These are golf carts, dune buggies, cars, trucks and trailers that have been modified in amazing ways to become everything from a giant anglerfish, a Cheshire Cat with mesmerizing eyes, an enormous glowing rubber duckie that is also a giant dance club (photo below), La Contessa (photo also below – a huge galleon ship on wheels), a giant fire-breathing dragon, Charlie the Unicorn, Neverwas Haul (a Victorian home that is powered by a forklift engine), a 9,000-pound Nautilus inspired by Jules Verne's submarine from "Twenty-Thousand Leagues Under the Sea," space ships, giant shopping carts and much more. Radical inclusion means people of all ages, ethnicities and countries attend the event. 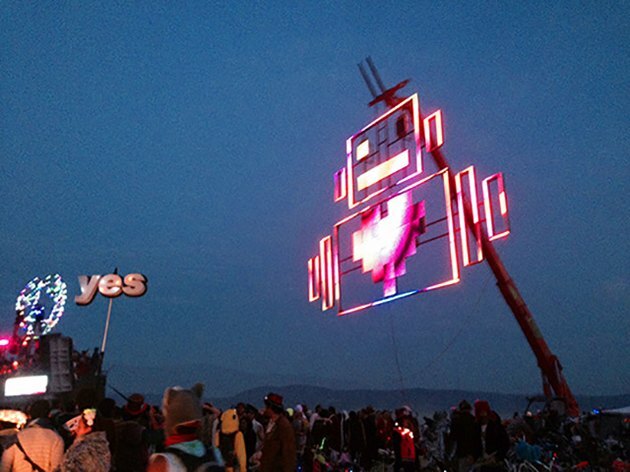 In 2013, 40 percent of the 60,000 people who attended were first-time attendees. 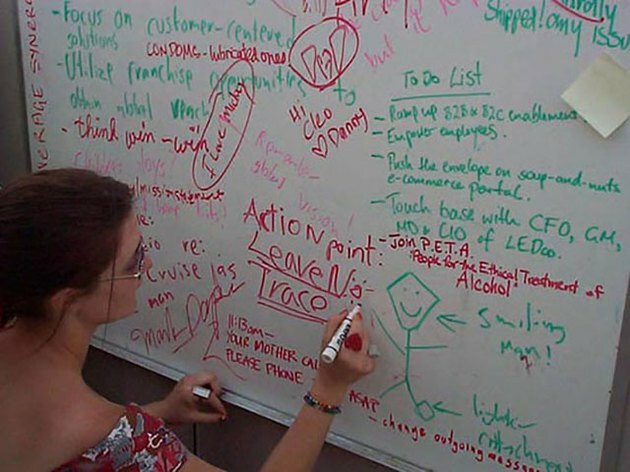 You’ll meet people who are teachers, scientists who work at NASA, people who work at non-profits helping the disabled, doctors, chefs, DJs, artists, famous musicians, tech geeks, nannies, etc. The best part is that they’re all (generally) interacting together doing things like building a geodesic dome, cooking a pancake breakfast for 50 people or singing “Amazing Grace” together in the Temple at sunset. And everyone dresses as creatively as I've ever seen anywhere else on earth: body paint, tutus, wigs, headdresses, muumuus, caftans, utility kilts and more (or less) are often all worn at once. Once you buy your ticket (which costs $380 and supports the city's infrastructure, including $4.5 million to the Bureau of Land Management for use of the desert space and $1 million for 1,000 Porta Potties), all events throughout the entire week are completely free. I've taken free classes in yoga, Kabbalah meditation and shiatsu massage, to name just a few. There have been TEDx Talks on flow states, energy awareness, micro-grids and ocean cities. 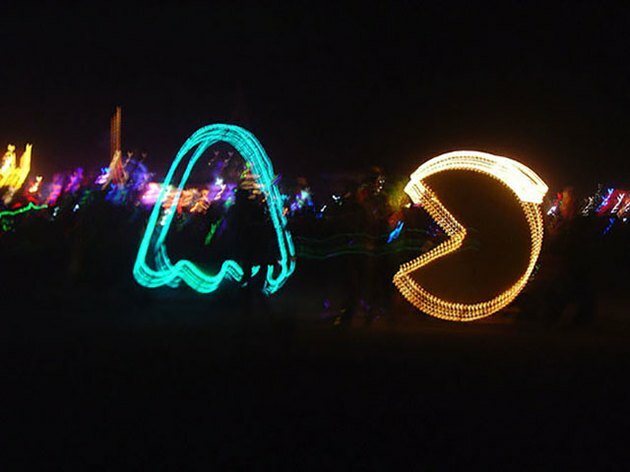 There are free pedicures, massages, body painting, fire dancing, hula hooping, seminars on world affairs, love potions, arts and crafts, even roller skating (with free borrowed skates) at the desert roller disco. 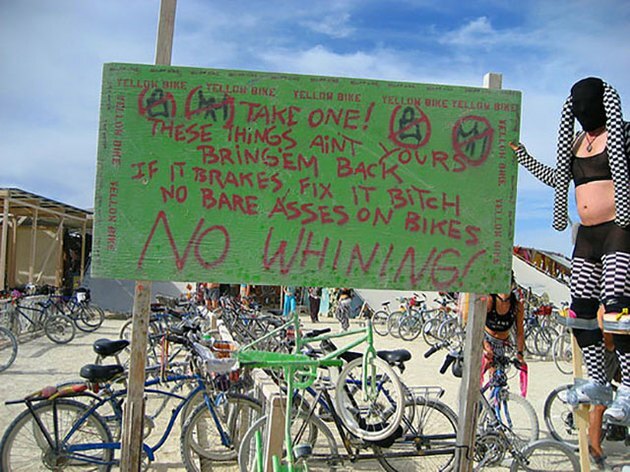 One of Burning Man's most important rules is “Leave No Trace.” You take out everything that you bring in. There’s no place to simply "throw" garbage. You need to be responsible for all your own refuse. Pack it in and pack it out. This ethos has caused me and the other people I have camped with to consider our impact on the environment and reduce packaging and reliance on disposable items, to carry a reusable, washable cup in order to avoid using paper, plastic or styrofoam whenever possible. 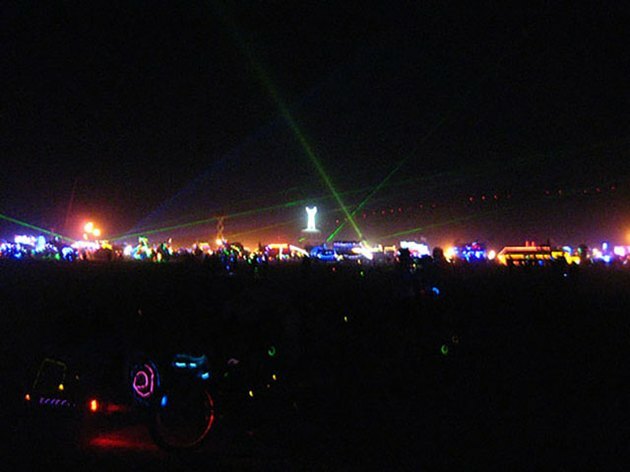 The lights at Burning Man rival the Las Vegas Strip and they are all created by people in just a few short weeks, so seeing it at night is awe-inspiring. 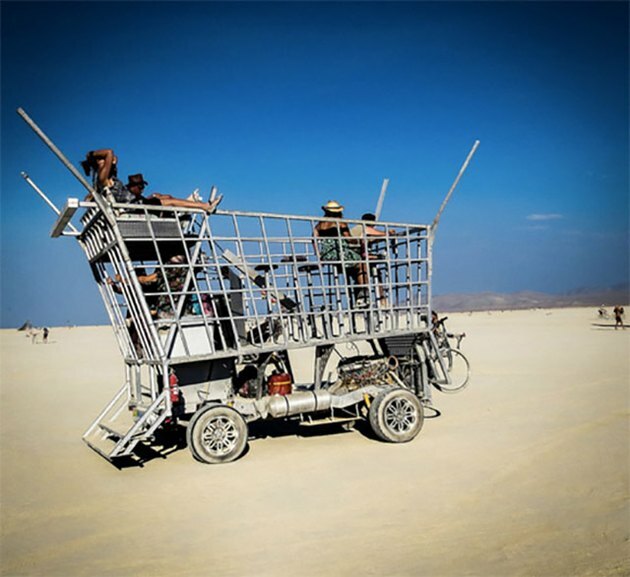 According to Harley K. DuBois, Burning Man’s Director of Community Services & Playa Safety Council, ”Theme camps are the interactive core of Burning Man.” There are hundreds of camps built around an idea or purpose, everything from Old West saloons to Math Camp (with "daily lectures and long-winded impromptu chats on all things math-related), Ask a Giant Goat the Meaning of Life to "What Would You Do for a Pickle?" camp. Over the years, I have camped with Nomadic Nutria Hunters (giving out free nutria jerky), Space Cats (with 24-hour karaoke) and in recent years "What Would You Do for a Pickle?" 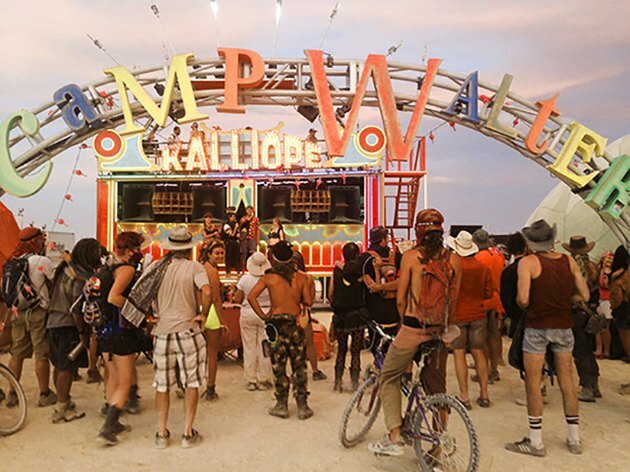 – a camp that gives away hundreds of free cold dill pickles each day from their pickle bar. I promise you that the sunrises and sunsets in the desert are some of the most beautiful and dramatic that you will ever witness, and they are made even more exciting when you consider that the sun is rising or setting behind giant 40-foot man on top of a space ship or an ornate temple constructed from balsa wood or an enormous ride on fire-breathing dragon. 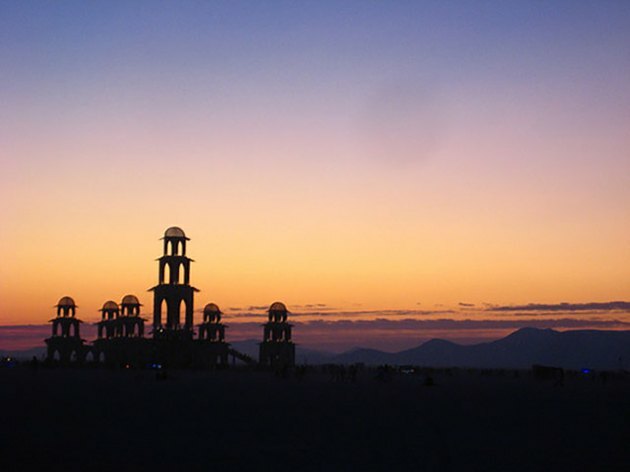 Whether you prefer Opulent Temple, DISTRIKT, Robot Heart, Disorient, White Ocean or Space Cowboys – from huge dance camps with the DJs, lighting, sound systems and pyrotechnics that rival any major dance club found in Vegas, London or Ibiza, to drumming circles, jam sessions, and one-person acoustic performances in the Center Camp café, the music at Burning Man is playing 24/7 and there is a constant buzz or hum as all the concurrent sounds mix inside your head. Also, all of these dance clubs are also massive camps or villages, where their founders, creators and fans live and volunteer to build and maintain the camp and make all the performances happen. With its extreme heat and cold, the desert is a harsh environment for camping. 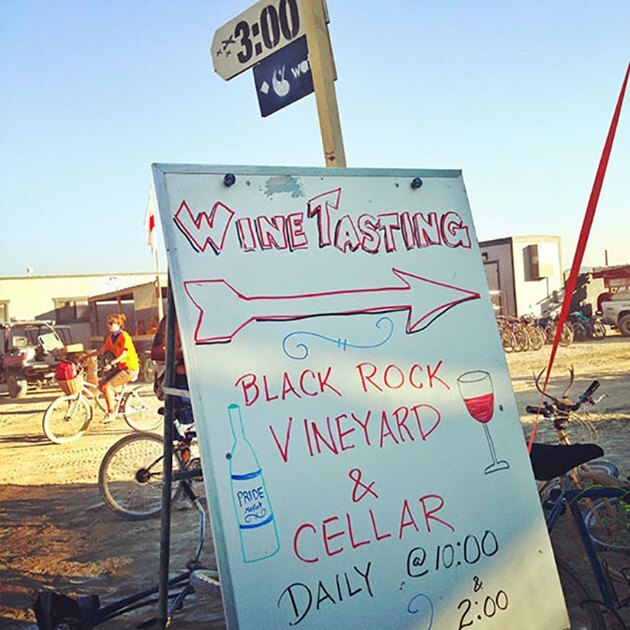 There are also windstorms and dust storms to contend with, which offer challenges for keeping tents, shade structures, camps and art pieces in place. Dust storms can create near whiteout conditions, which can be disorienting and dangerous to drivers of (art) cars and bikes. Bringing goggles and dust masks can help protect you from the worst of it in your eyes and nose. Then, you can focus on the fact that dust storms can create beautiful, dark and post-apocalyptic scenery. 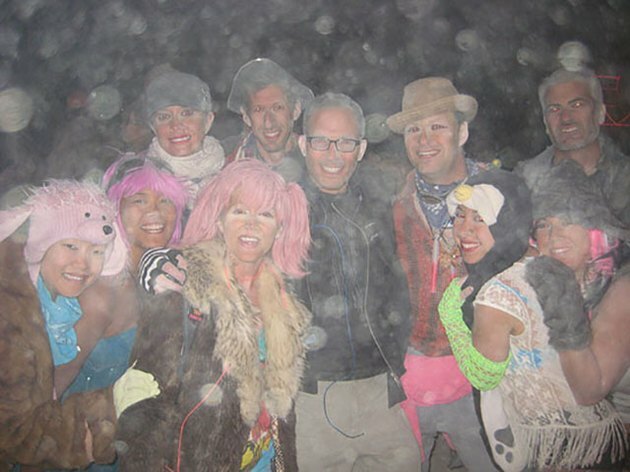 The ethos of Burning Man is that you must prepare for the event. This means attendees - who are called “participants” - must be prepared to be self-reliant and self-sustainable. You need at least a gallon of water per person per day, lights to light up yourself and your bike at night and your own food (with extra to share with others). The desert can be a dangerous place to live for a week. Since cars are forbidden, everyone walks or rides their bikes to get around. This means there are thousands of bikes, and most of them are decorated fantastically or crack-tastically. There’s nothing so wonderful as biking out across the flat desert, feeling the wind in your hair, and seeing the colors and/or lights of the city fly past. 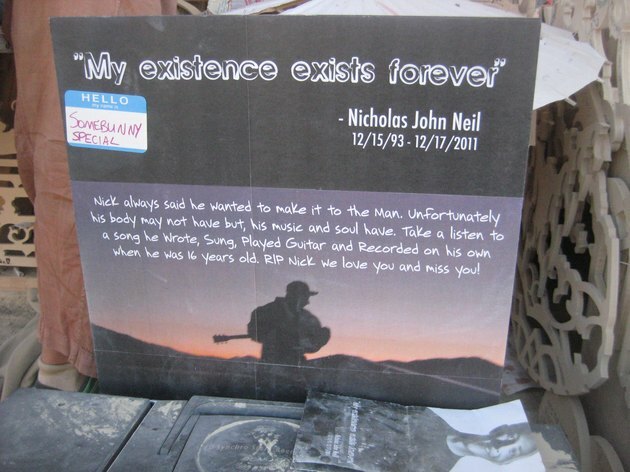 This is probably my number one favorite thing about Burning Man. 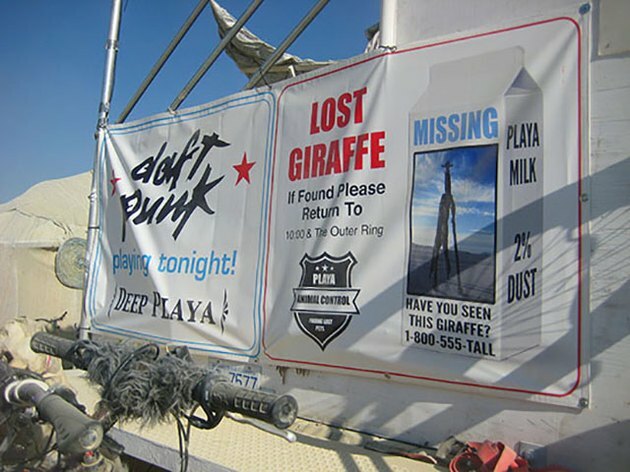 When you walk out into the unmapped desert (the open "playa"), you can happen upon any number of interesting people, interactive projects and art pieces, from signs advertising condos for sale to the ongoing joke that Daft Punk is playing a “secret show” way out in “deep playa.” Some projects that my friends and I discovered included a full office cubicle, a man pushing a circus cart serving warm kettlecorn, a man working at a white booth called The Oracle, a phone booth to “Talk to God” and much more. 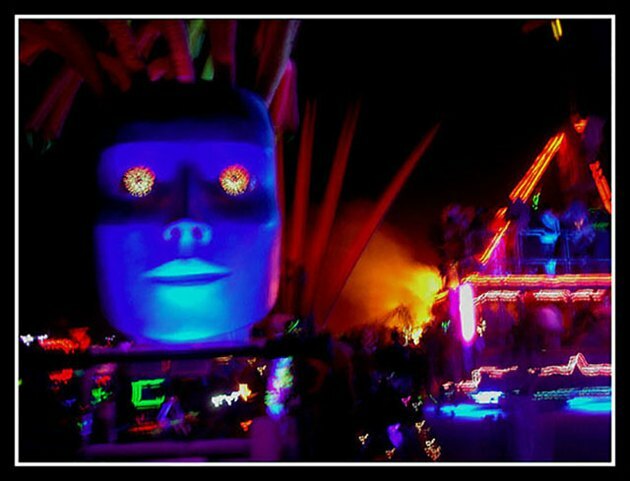 If I’ve convinced you that you want to go to Burning Man, check out the event's website and FAQ, and start planning now. 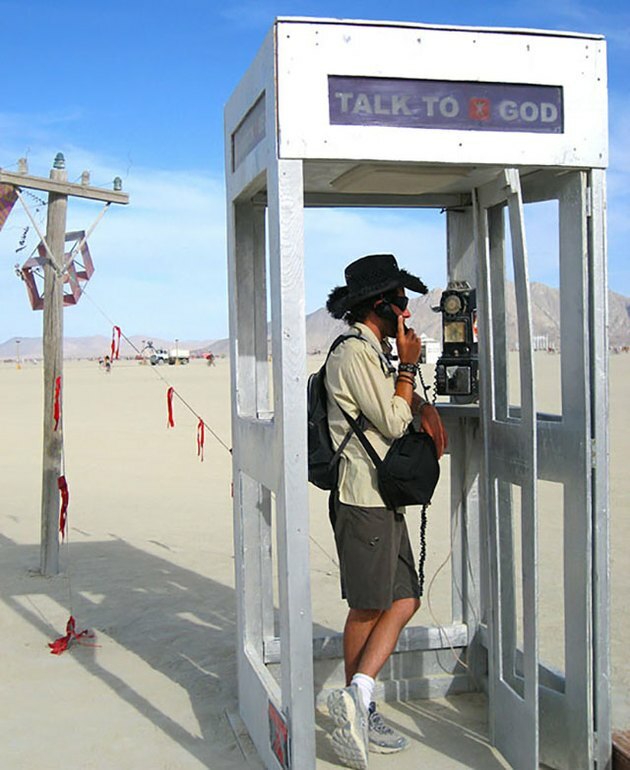 Burning Man can be one of the most amazing events you will ever experience, so long as you go prepared. 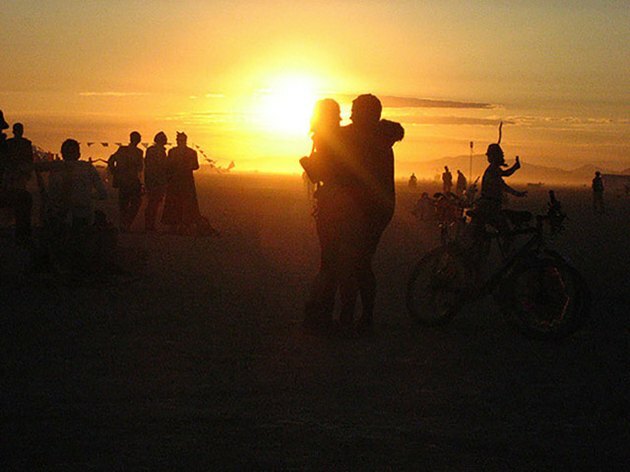 To fully understand the culture of the event and everything you need to enjoy it, be sure to read The Burning Man website's First-Timers' Guide. 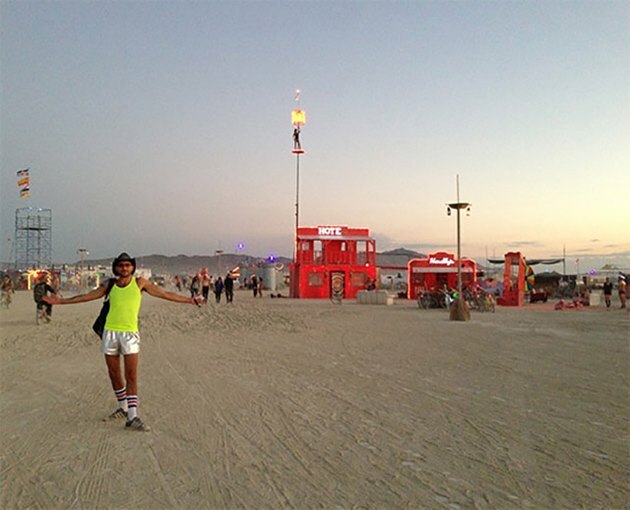 Readers - Have you ever been to Burning Man or a similar event? What did you think? If not, would you ever consider attending it, why or why not? Leave a comment below and let us know.